Grains, contrary to carb-phobic belief, are good... but supergrains are even better. Admittedly, adding "super" to any food can make it sound healthier (supercheeseburgers! ), but as with other superfoods, supergrains offer ample bang for buck when it comes to vitamins, minerals, and antioxidants. They just might help you live forever. Living forever means little, though, if the environment's in dire straits. Simply put, relying on wheat and corn production is just as disastrous for sustainability as gorging on them is for a person's diet. The Rise of Quinoa made the world realize that there's more to grains than wheat and corn -- it helps that it happens to be absurdly nutritious. But since overreliance on quinoa production is no better than dependency on wheat or corn (even if it's, you know, "super-reliance"), it's time for some supergrain diversification. What is it, and why is it super? One of the most ancient ancient grains out there -- cultivated by the Aztecs between 6,000 and 8,000 years ago! -- amaranth is a veritable nutritional storehouse. The tiny seed is a huge source of plant protein, with 9g of protein per cup, making it an excellent choice for vegetarians looking to up their amino acid intake. It's also big on calcium, iron, and, according to noted physician and holistic health practitioner Dr. Andrew Weil, has three times the fiber content of wheat. All signs point to a waistline-friendly grain that's also low-cost to produce; it may even help Mexico in fighting obesity and combatting malnutrition. How farm-to-table-menu-ready is it? In 1984, The New York Times called amaranth, "Ancient, Forgotten Plant Now 'Grain of the Future.'" Well, the future is right about now, so... where's that amaranth? Popped amaranth is a frequent star ingredient in packaged nutrition bars, but it's not often that you'll see the seed pop up on a menu -- and there's not a whole lot of rationale why. It's cheap to grow, cheap to buy, and low-maintenance to cook. Plus, it's versatile: it can be cooked like rice or quinoa, used to thicken up soups and stews, popped for snacking or breading meats, and pronounced in a wide variety of accents to great comical event. What is it, and why is it super? Millet may be the primary ingredient in birdseed, but it's not just for the avian creatures who will someday make you their prey. It's packed with nutrients hard to come by among other grains, namely copper, manganese, phosphorus, and magnesium. The resilient crop with a short growing season was critical in transforming Chinese and Mongolian nomads circa 5400 BCE into settled farmers. So the next time someone asks you for some super on-the-go snack tips, you can impress them with your knowledge of the ancient seed's agricultural history. How farm-to-table-menu-ready is it? Millet may be cropping up on some trendy menus, but NPR reports that the not-just-birdseed is in dire need of an image makeover, one that will convince people who feel iffy about eating what birds eat that millet isn't just for the winged ones who will soon inherit the Earth. If that weren't enough, Paleo diet proponents warn against incorporating the post-Paleo grain into their neo-Paleo lives, claiming, "From an evolutionary perspective, these foods were rarely or never consumed by our hunter gatherer ancestors," and going on to argue that high-millet diets increase the rate of iodine deficiencies and thyroid dysfunction. What is it, and why is it super? 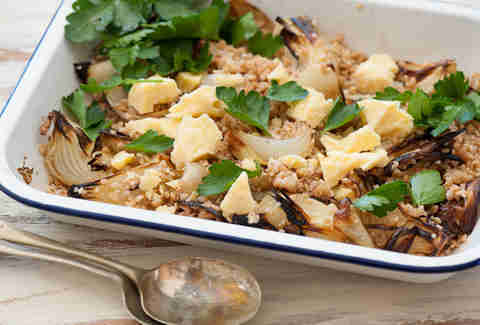 Nigella loves farro. Giada loves farro. Everyone loves farro, because farro is delicious. It's nutty, hearty, and -- when cooked properly -- perfectly, how the Italians say, "to the tooth." In the US, farro is usually emmer, though "farro" can technically be one of three varieties of wheat. 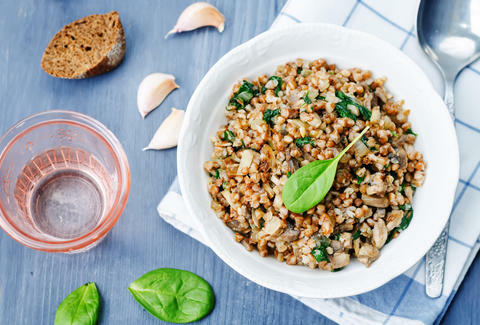 Unlike many of its supergrain siblings, farro isn't entirely gluten-free, so it might not make the most ideal low-stress potluck dish; but it is a good plant-based protein source, plus it's high in magnesium. How farm-to-table-menu-ready is it? Listen. There's already a restaurant in existence called Il Farro in Newport Beach, California that's served primarily farro pasta for the past 10 years plus! Farro isn't just menu-ready -- it's in the kitchen, it's on the stove, and it's waiting for you. Go. Be farro, be free. What is it, and why is it super? Teff is a poppy-esque seed that's loaded with calcium; one cup of cooked teff contains 347mg of calcium, making it a smart choice for vegans and lactose intolerants. It grows quickly too, upping its rank on the sustainability scale. According to aptly named The Teff Company’s section on "Entertaining Teff Trivia" -- the teffs keep on teffing! -- just 1lb of teff can yield one ton of grain in 12 weeks, easily beating out wheat on the speed and efficiency scale. It's also something of supergrain royalty, distinct in its historical role as one of the first plants domesticated by people, dating back to Abyssinia and Ethiopia. It continues to be a staple of the Ethiopian diet today, especially as a component of the spongy injera. How farm-to-table-menu-ready is it? Teff bears both growing and unit prices comparable to quinoa -- so, not particularly cheap -- but less versatility. Its chief recipe function is in porridge. And how often do you see porridge in a [non-Goldilocks-themed] restaurant? While restaurateurs and chefs may not be rushing to put teff on their menus, consider adding the seed-grain to your breakfast rotation. What is it, and why is it super? Einkorn may be relatively new on the foodie scene, but it's one of the most ancient plants at our disposal, having been first domesticated more than 10,000 years ago. Although einkorn is a gluten-containing wheat, it boasts loads of carotenoids and protein compared to the conventional stuff. How farm-to-table-menu-ready is it? Einkorn isn't the easiest grain to grow. It's low-yield, and high maintenance when it comes to milling, so it likely will be some time before einkorn muffins materialize at your local bakery. What is it, and why is it super? I know what you're thinking. "Hey, buckwheat is wheat! It's right there in the name!" Friend, what if I told you that buckwheat is not wheat, but in fact a cousin of rhubarb? It's true. Hulled buckwheat grouts look, taste, and function like grains, and can be used in everything from flour to noodles, like traditional Japanese soba. Buckwheat is low on the glycemic scale, making it a more healthful option than rice, wheat, and corn. Oh, also, it has "an amino acid composition nutritionally superior to all cereals, including oats." INCLUDING OATS. This is huge. How farm-to-table-menu-ready is it? Any Japanese or Japanese-inspired restaurant offering soba has long won the "How Supergrainy Is This Menu" battle. 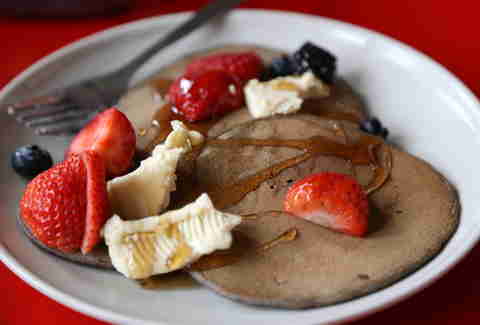 Beyond soba, it's not unusual to find buckwheat pancakes gracing a brunch list, especially in the South -- where buckwheat's fabled as a favorite food of Washington and Jefferson -- or at Southern-inspired restaurants. Stephie Grob Plante is a writer based in Austin. The word "super" has not lost all meaning to her yet! Follow her: @stephiegrob.